Microsoft Virtual Academy is one of the best online IT academy with lots of free online IT courses, that available for everybody who want to expand their knowledge and information. MVA provides exactly what you need to deepen your knowledge. Discover how to get started today and get expert for working professionally. MVA is free for anybody interested in advancing their career through training on Microsoft technologies. You can watch or download videos and slides without signing in, but to get full access to all resources, including learning plans, self-assessments and live events, you will need to use a Microsoft account and create an MVA profile. Your profile is a record of the time you invest here, including the certificates of completion for the courses you take. How to Register on MVA? You can register to MVA with a Microsoft account. If you already don’t have any Microsoft account, go to outlook.com website and create an outlook account freely. Next login to MVA with your newly created email account. Note: Creating outlook account is easy. Just go to outlook website and sign up for a new account. Fulfill the registration form with your correct information and follow the next steps. To get started, simply pick a course that interests you and begin watching the videos in each module. You’ll be able to download the presentations and also test your learning with assessments. Once you have completed every lesson in a course, you will get a certificate of completion. When you attend a live event, you also have real time access to experts who can answer your questions during the training. On your Dashboard, you can manage personal learning plans and see how much of each course you have completed. Your Dashboard automatically records your progress and stores your certificates of completion which are available for you to download and print. Your dashboard reflects the commitment you’ve made to skills up. My Learning Plan is a way to organize courses your interested in… Once you register as an MVA member, you can add courses to a plan by clicking Add to my learning Plan next to the course descriptions. You can edit and manage your learning plans from your Dashboard. You can store up to 10 learning plans. You can have up to 10 courses in each plan. 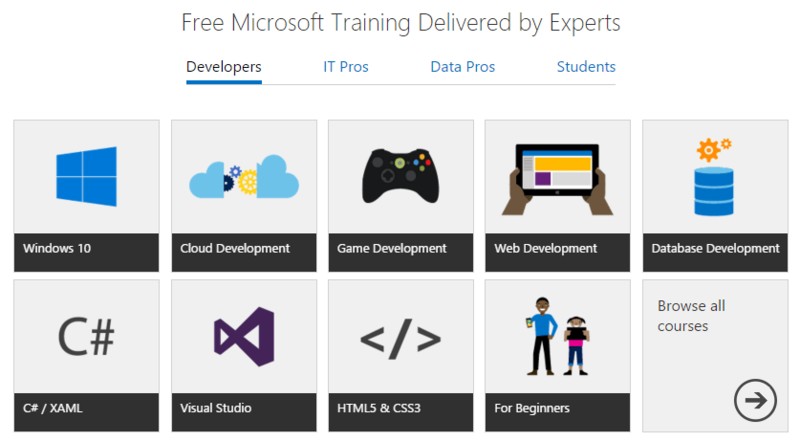 So there is no reason to postpone your learning and improving skills with these huge free online IT courses on Microsoft Virtual Academy. Studying a hour daily will change your life and get you expert.